Natural Born Psychic Medium, Author, Actress, Blogger, Video Blogger, Webmistress, Product Creator, Podcaster, Wife, Cat and Dog Mom. Describe your areas of expertise.I specialize in Pendulum, Psychometry, Auras, Charts, Cold Cases, Criminal and Missing Persons Cases. How long have you been aware of your abilities, and how have you developed them?I have been aware of my abilities since the age of 21, but have been Psychic since the age of 3. Everything comes to me by natural genetics. I am not sure how to develop something I have naturally. Name some specific experiences where you've used your abilities.I have helped solve several Hauntings, Missing Persons Cases and Criminal Cases. What can a caller expect from a consultation with you?The most accurate Reading within 90%. 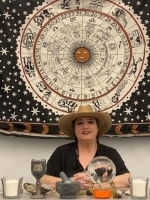 https://www.spreaker.com/show/the-outlaw-psychic-show Join me on April 23, 2019 at 10:00 am PST for my 100th Podcast Show! You can now Skype and Webcam me for a one on one Reading. For those that I was able to reach, Thank You for your patience and Thank You for letting me and Spirit work for you.